I enjoying sharing recipes showcasing ingredients that are not commonly found in America. 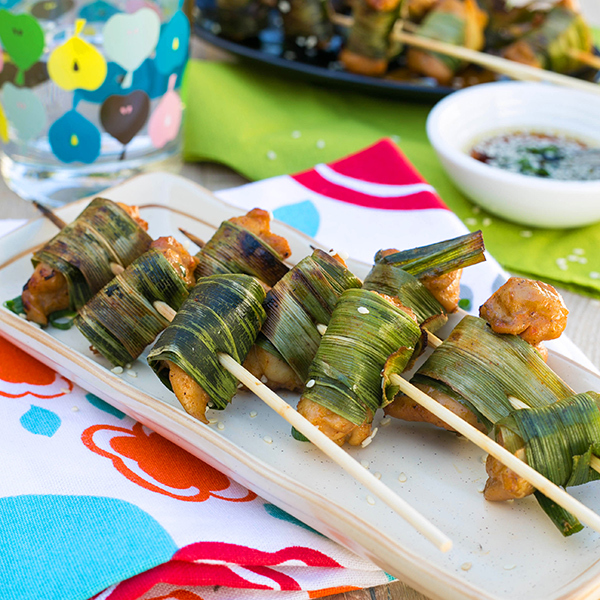 When I saw frozen screwpine leaf (aka Pandan leaf) in the Asian market, I thought wouldn't it be cool to grill some chicken skewers wrapped in this fragrant leaf? This recipe is my riff of the French “en papilotte” paper wrapped food parcels. 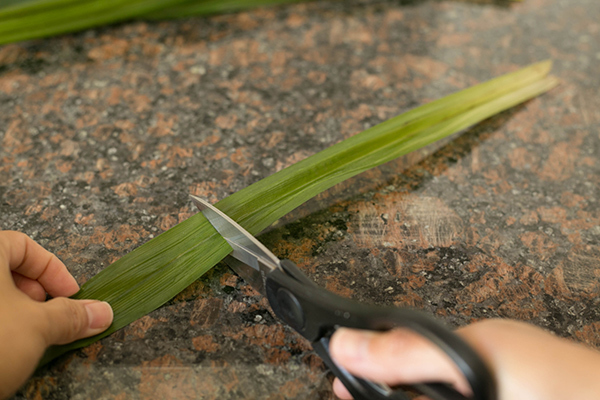 So what’s a screwpine or Pandan leaf? It’s commonly found in tropical countries and the palm-like shrub looks a bit like the Nile Lily plant and its leaves have a fragrant scent which, to me, smells a bit like green apple mixed with vanilla. It’s often used in cooking in Singapore, Malaysia, Indonesia, and Philippines. 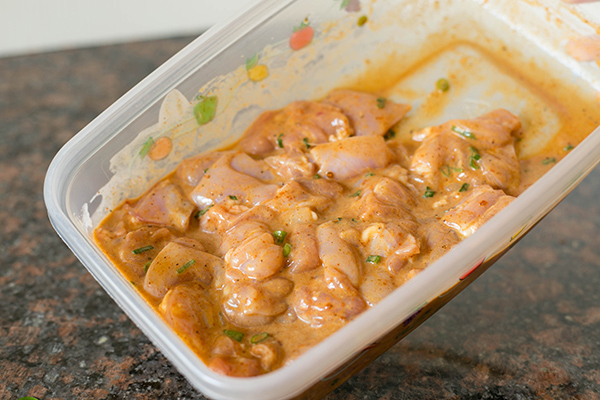 It's used to wrap chicken, meat, fish, and desserts before they are barbecued or steamed. They add distinct, sweet, floral-like notes to foods. Many homes in Asia which have a yard or space for a potted garden will have lemongrass and screwpine shrubs similar to rosemary bushes common in American gardens. The fronds are tied into a knot and often tossed into the rice cooker to perfume the rice. 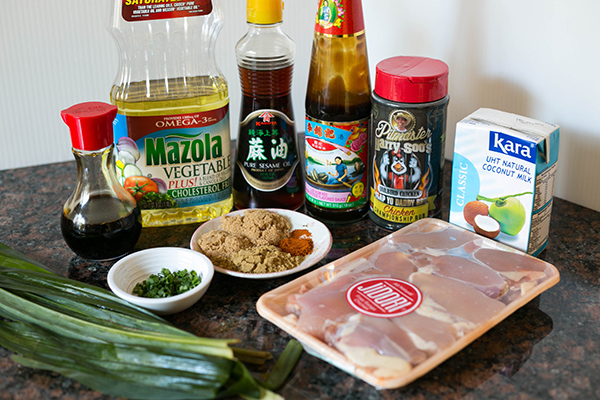 I made an Malaysian style marinade which combines Chinese, Malay, and Indian ingredients to create a sweet exotic flavored chicken bites that’s paired with a complimentary soy dipping sauce. Your guests will unwrap these bites like precious gifts. Ask your guests to discard the wrapper leaves as they are inedible. 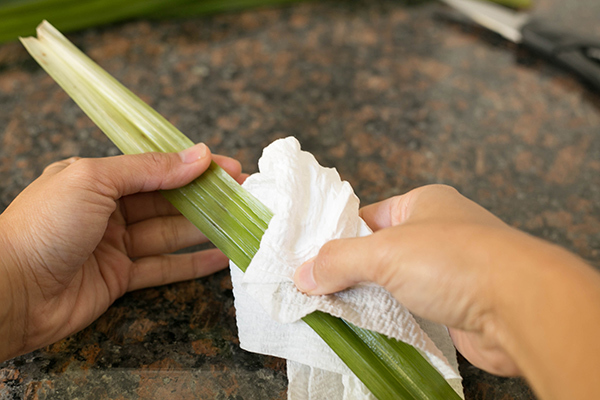 Rinse the pandan leaf and dry each leaf with paper towel. Cut the leaf between 6-8 inches in length. 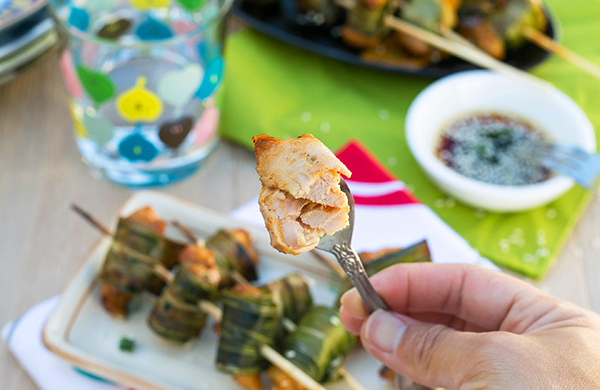 Place a piece of chicken meat on the pandan leaf and roll away from you. 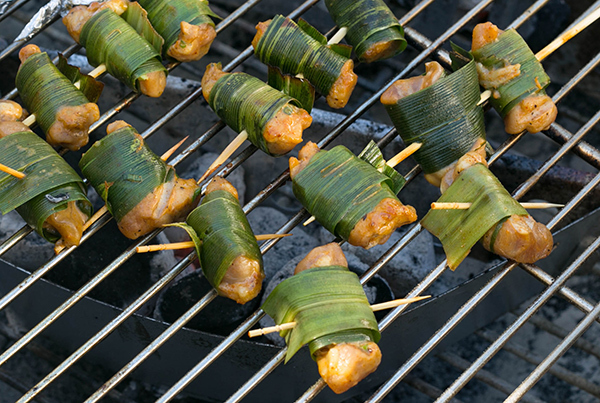 You can also thread 3 pieces of pandan leaf wrapped meat with a wooden skewer. 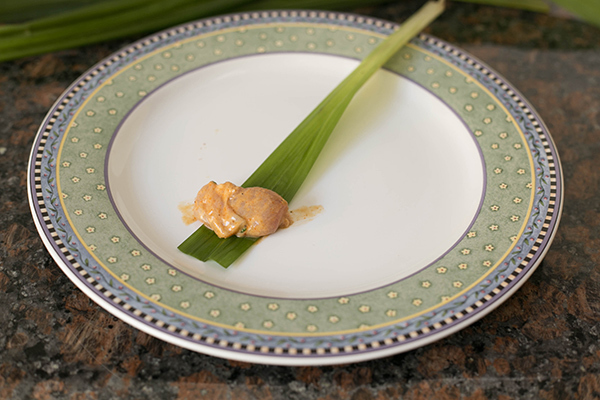 If you don't have pandan leaf, you can use banana leaf. 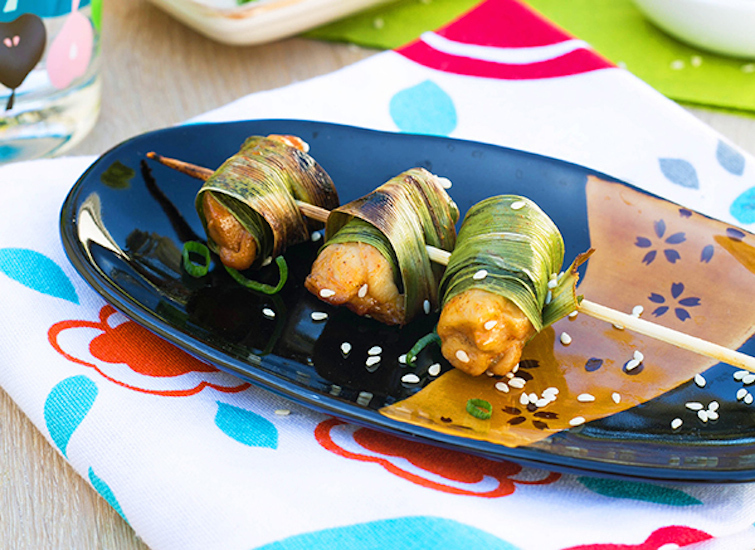 If you don't have banana leaf, you can use some foil. Put the chicken pouches into a preheated 325F grill set up with a hot and cool zone. Place the pouches on the cool zone. Move chicken to hot zone to get some char on the leaf and remove when internal temp is 160F. Discard the screwpine leaves before serving as they are inedible. Mixed feeling about presentation. Pandan is great for flavor but not so good for eating unless you turn it into a paste. 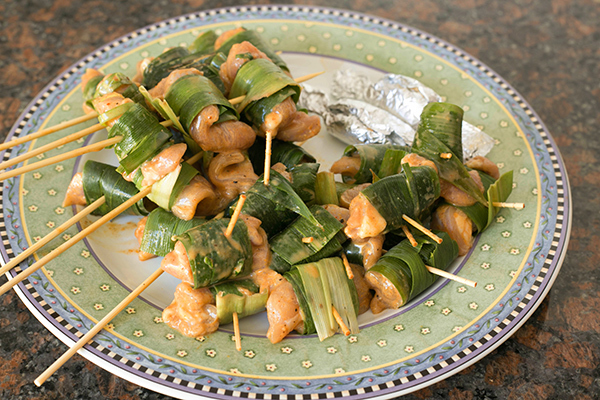 I envision folks trying to chew through the pandan leaves if you hand them pandan wrapped chicken on a skewer. You are absolutely correct. Thanks to your comment, I revised the recipe to emphasize the leaves are for cooking and flavoring the chicken bites. They are inedible so if folks try to chew through the pandan leaves, I would be aghast!